This is a basic introduction and is not intended to replace the sound advice you will be able to get from a good supplier, but will acquaint you with the background to the subject. Here are three common setups. Then we’ll discuss how you get there. This is my own unit. I looked at a number of other options but, not being much of a handyman I decided to buy “off the shelf”. I obtained the 3-tap font separately - some of the fonts that come with complete E-Bay packages are cheap Chinese jobs and not of particularly good quality. This is undoubtedly the most popular setup and involves a little drilling and screwing, and of course obtaining a good second hand fridge, or even adapting a brand new one. Although brand new fridges are comparatively cheap nowadays they tend to be tall and thin in the cheaper ranges and to buy one that can hold two or three kegs, then adapt the unit, it usually works out around the same or even more expensive than buying an off-the-shelf kegerator. There is of course the danger of buying someone else’s problems when you get a second hand fridge. But if you can get a reliable one then this can be the least expensive way to go. 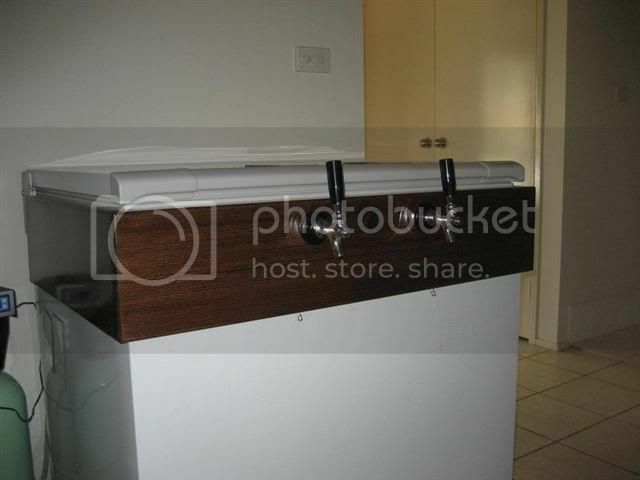 The pictured unit has been fitted with a home built ‘collar’ to increase the height of the unit to accommodate kegs and plumbing, and to provide a place to run the taps through without damaging freezer tubing that runs inside the walls. The freezer needs to be fitted with a temperature controller to keep it at serving temperature. Smaller freezers, whilst the can be bought cheaply brand new, do not adapt as easily as do fridges to kegging as they usually have a large ‘hump’ inside the freezer which contains the motor and condenser unit. Modified freezers, however, also lend themselves nicely to upright fonts. 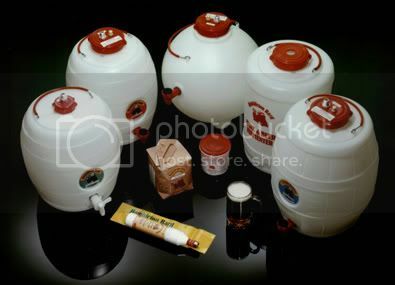 Pressure barrels have long been very popular with home brewers in the United Kingdom. They hold a full normal 23L brew and can be sugar-primed to provide an initial charge of CO2 gas. As the beer is drawn off , the protective CO2 blanket can be replenished using a small gas charger that takes sparklets bulbs. This is a really good compromise to serve “real ale” type beers which do not benefit from high levels of carbonation. In colder climates the pressure barrels can just be kept at ambient in a cool garage or shed and even popped into a fridge if needed. However these barrels are not particularly suited to many International styles such as lagers and are mostly confined to use in the UK. Read this rundown on Wikipedia, which will give you the background. As soft drink dispensing has gone to bag-in-a-box, vast numbers of good used Cornies are available in the trade. The majority are ball-lock and only these will be discussed here. 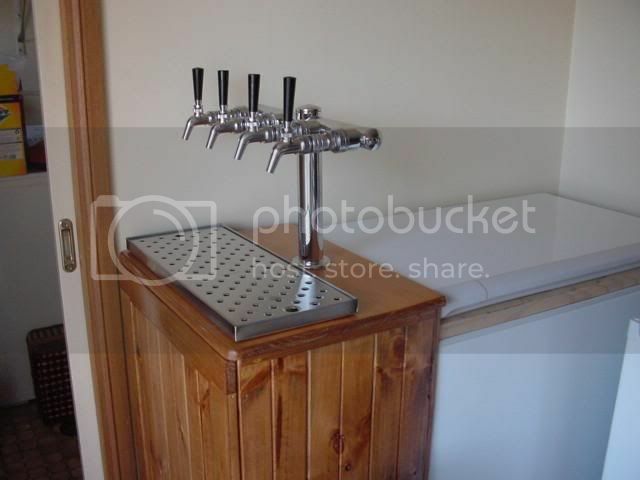 The keg has two outlets or ‘posts’ – Gas In and Beer Out. They may have slightly different shapes as in the following photo, or “In” and “Out” will be moulded into the black casing next to the post. 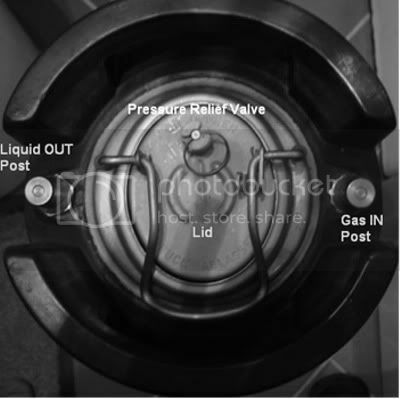 To get the gas into the keg and the beer out you will need so-called Quick Disconnects – (QD) a grey one for the Gas and a black one for the Beer. Remember: Grey for Gas and Black for Beer. 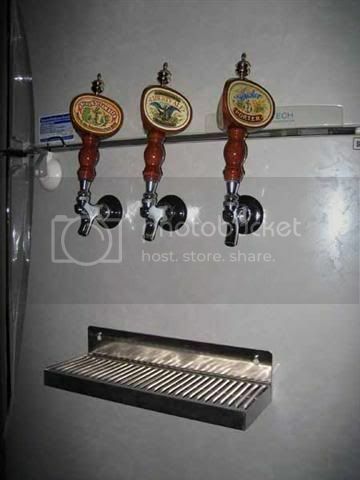 The QDs pop onto the two posts and connect to plastic gas and beer lines, one to the gas supply and the other to the beer tap. More later. To remove the lid the spring lever assembly is levered up to release the lid downwards, then the loose lid is manoevred out of the keg. When reassembling, the lid is manoevered back into the keg, held in place and the spring lever assembly pushed down to raise the lid up hard onto the O ring, sealing the keg again. Now you have your gas in QD with a gas line attached, you need to connect it to a gas supply. The bugbear of kegging is the gas supply. 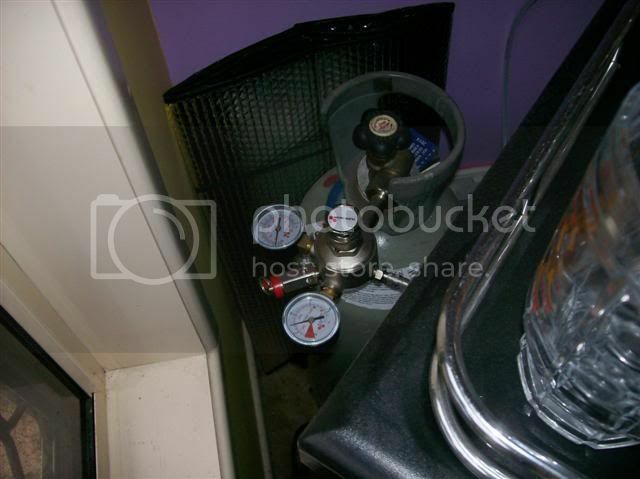 Although CO2 is not expensive, per brew, a gas cylinder is expensive to buy or rent. I rent one through an industrial gas company for around $AUD 3 per week. However once the cylinder has been set up, it is low maintenance and can usually be forgotten about until it needs refilling. One thing you have to have is a ‘regulator’ or “Reg”. The pressure of CO2 in the cylinder is way too high for serving and the pressure needs to be stepped down to serving pressure. 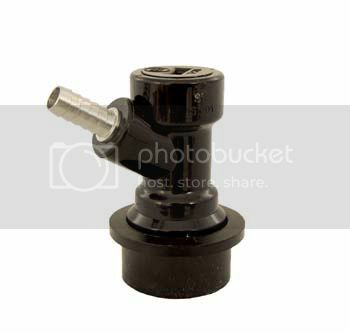 Here’s my regulator, a middle – of the range unit. The advantage of dealing with an industrial gas supplier is that there is one in every area as they mainly exist to service mechanics, welders etc in the district. However they often will only refill their own brand of bottle so be careful if you decide to adopt an alternative type of supply. Some home brew shops offer to sell you an “own brand” bottle which can be exchanged for a full one. This is fine but if you are not near a home brew shop, or if the shop goes out of business and you need to travel to an alternative shop, this can be a hassle. Most industrial dealers will not fill these bottles. 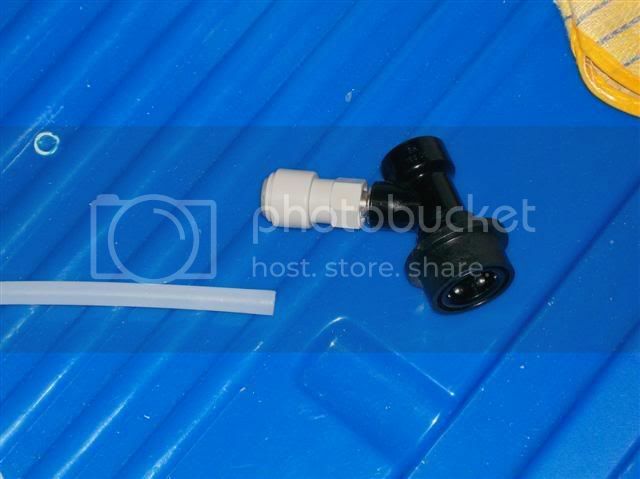 You can easily buy keg “chargers” which take bulbs or small cylinders such as “Sodastream”. Convenient but far more expensive for gas in the long run. I actually have a keg charger for occasional use if I take a keg to a party or a brew-day. Some brewers convert Carbon Dioxide Fire Extinguishers. This is an advanced subject I won’t cover except to say that refilling can also be a problem if the fire extinguisher’s safety “approval” has been compromised. For the purposes of this article I’ll assume a ‘normal’ CO2 industrial cylinder and a regulator. Your other QD (the black one) now needs to be connected to a tap for serving. Here are the alternatives. The quickest, easiest and cheapest is to get a ‘party tap’ plastic unit such as a ‘Bronco’ tap. They work very well but the disadvantage is that you need to open the fridge door every time you pour a glass. 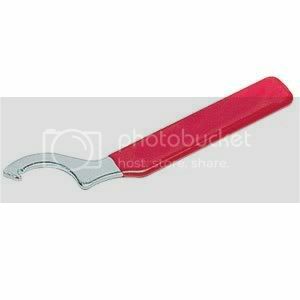 However they are almost universally used as party taps. If you have a modified fridge or a freezer with a ‘collar’ then you will be interested in fitting taps that run through a hole you have drilled. Complete units are available in various price ranges. 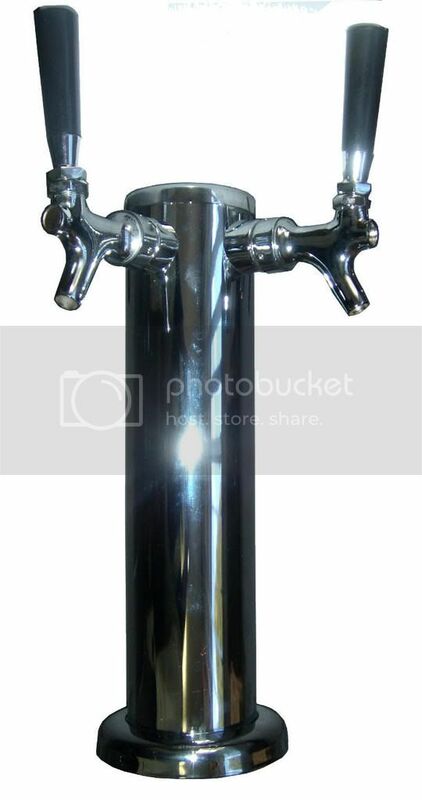 The word “Font” comes from the same root as “Fountain” and this style of tap is the most ‘showy’ of home brew dispensing taps, very common in Europe and extremely popular in Scotland in the 19th and 20th Centuries when they did not have hand pumps but dispensed their ales by means of a ‘water engine’ to the fonts at the bar. The standard style is a cylinder rising from the kegerator or bar, with one two or three taps. Not cheap, but very robust. Of course the font body itself is not full of beer – it’s just for show - and there is a bit of a nest of thin plastic piping running up and down inside the more complex fonts but most have colour coded tags so you can tell which line goes to each tap. The base of the font simply screws down into the underlying surface, with an off-the-shelf kegerator there are corresponding ‘female’ holes to fix down into. There are more elaborate fonts as shown above in the section discussing freezers. One disadvantage of a font is that despite its eye candy appeal, in between pours, because the font itself is at room temperature, there is enough warm beer left sitting in the line that the first glass is not as cold as the interior of the fridge. An advanced work-around is to install a computer fan at the base of the font to constantly blow cold air up into the font body. Not covered here. However some brewers are so obsessed with obtaining the zero temperature glass of lager that they obtain so called “flooded fonts” of the sort you see in pubs. These use a separate freezing unit and a pump that circulates sub-zero ethylene glycol through the body of the font, usually covering the font itself with a layer of frost. The technology is not difficult to install, but a frozen font set can run to thousands of dollars if bought off the shelf. So you have bought a fridge of some sort, obtained some taps or a font, got your gas and a Reg and now need to put it all together. First off, look at these two Beer-Out QDs . Yes the black ones. Can you see the difference? One of them has a ‘barb’ which you push the beer line onto then hold it in place by means of a small circular clip that crimps on the outside of the tube. The other one has a threaded outlet that obviously is crying out for something to be screwed into it. So what is that thing? Here’s a picture of one of my Beer-Out QDs. 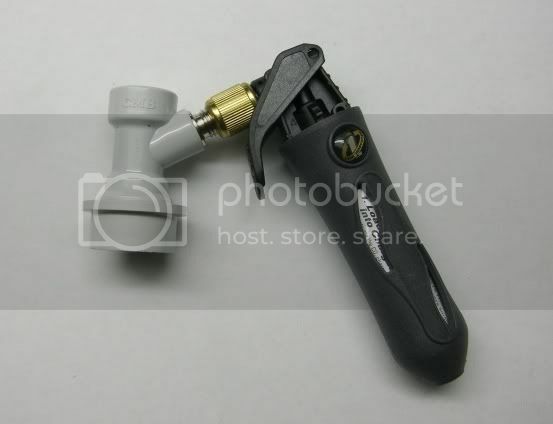 The grey thing is a “female adaptor” connector. 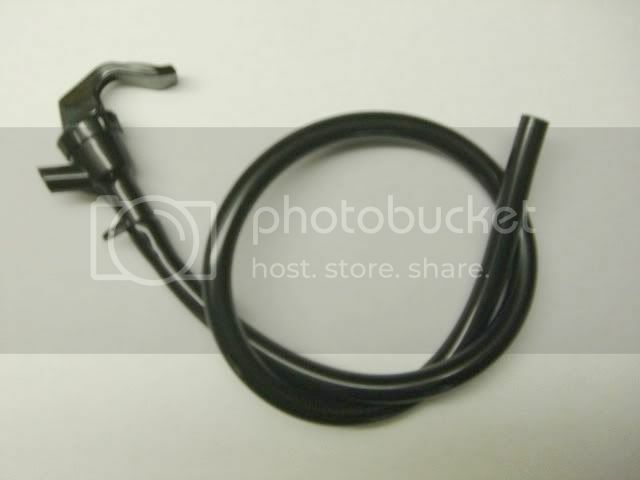 It’s actually a sort of a mini-QD in its own right and I can push the beer line into it, the connector will grab it, and I can take the line out again by pushing in a movable plastic collar to release it. A QD on top of a QD? What’s the point? Well you can connect your whole system together using barbs, and you will get a rock solid system that will hang together. However a barbed system is set in stone, but it is often handy to be able to disconnect lines, take the system apart and plug it back together again, extend it etc. 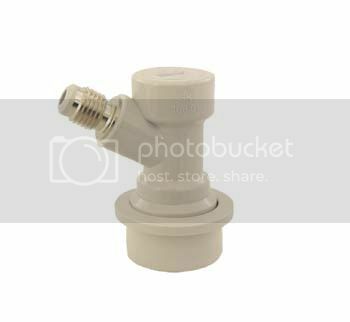 For a few extra dollars I would encourage you to look into these fittings (Sold internationally as John Guest Fittings). This splits a gas line into two lines to go to the QDs of two kegs sitting next to each other. How easy is that, just push the lines in and the JG fitting grasps all the lines instantly. 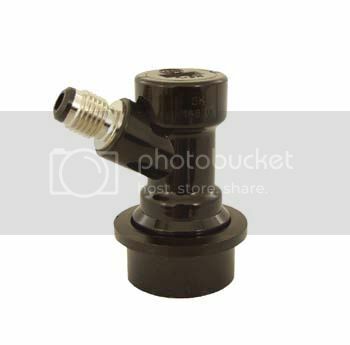 Like any good Lego set there are a number of JG fittings that enable you to connect two, three or more kegs to your gas line. Your Reg is probably going to be barbed – once fitted you don’t need to change it, so no worries. So you will need a length of line to go from the Reg barb into your fridge or kegerator. And a little round crimp clip on the Reg end of the line. (see photo of Reg previously). With a converted fridge you will need to drill a hole. For a freezer, put the line in through a hole drilled in the collar. Some people dig a bit of a hole in the rubber seal of the freezer lid so they can sneak the line in there. A kegerator will have a dedicated hole. and for four kegs use two Equal Ts…… and so it goes on. JG has a big range of equal thingos for different tasks, as it can get crowded in that area. You will then need, for each keg, a Gas-In QD , either a barb type or the threaded type that takes a JG female adaptor (recommended). Ok the gas is now in the keg. 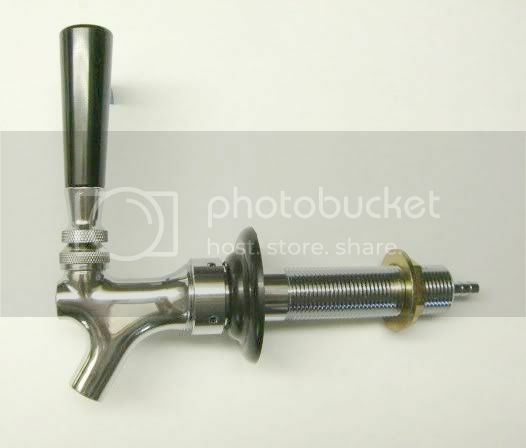 To get the beer out to the tap you will need a Beer-Out QD of barb type or the threaded type that takes a JG female adaptor (recommended), and some line to the tap. Now when you get to the tap itself you may have a choice of barb or JG depending on the brand. The horizontal tap in the previous photo happens to be barbed as you can see. Again if you can get taps that take JG fittings it makes it more flexible, you may want to take a tap out of service for repairs and redirect the beer line to another tap. However this is a ‘beginners’ and if you delve deeper there’s a frightening array of parts and bits out there as you would expect in a beer industry that services billions of drinkers around the World. Ok take a break and have a beer, you now have all the parts to connect up. But you now need to balance the system so you are not pouring a dribble of flat beer or a mass of foam. You won’t be changing kegs and cleaning lines as often as in a pub, one would assume. Personally I only clean my lines every three or four keg changes because I usually have a keg to go, plug the new keg in immediately and use the first rush of the new beer to flush out the line. I have a friend with a one-keg system who cleans his lines once a year whether they need it or not. And has never had a problem. However if you are a regular cleaner, a good idea is to put some cleaning fluid (a solution of Saniclean or alternatively Starsan – available internationally) into an empty keg , connect up to the gas and pour a jug or two of cleaner out of the system. There are several commercial line cleaners available that you can source through your local catering suppliers. Servicing of the taps is essential. 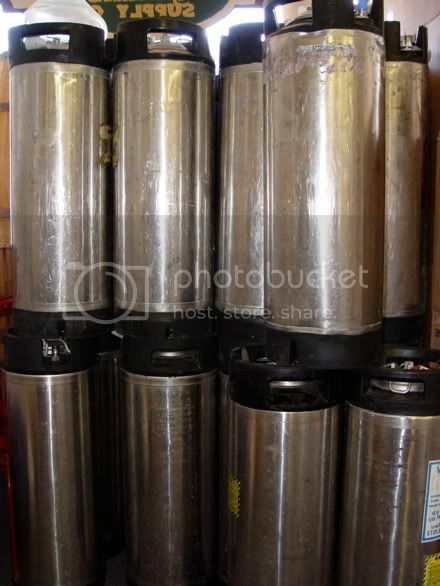 Even towards the end of a keg they can become sticky and can even jam when trying to pull, from gums and residues that build up, and it is a good idea to carefully dismantle and clean and lubricate them regularly. Look at this photo again. It’s a faucet wrench, and easily dismantles the tap. Disconnect the beer QD first of course. It’s counter – intuitive, you need to turn it clockwise to remove the tap from the assembly and counter clockwise to tighten it up again. Works on font taps as well, the system seems to have become standardised. Once the tap is off, you can easily unscrew bits and take it down to its components, wash them all up and reassemble. There will be a cylindrical slider that goes backwards and forwards in a ‘barrel’ and this needs to be lubricated with a smear of keg lubricant. This special lubricant won’t affect beer foaming. To clean the Kegs themselves, my method is to store an empty keg ‘dirty’ but still pressurized until needed. If the beer was good then the keg can sit for weeks. Then release the pressure by burping it, take off the lid and then treat it as a huge home brew bottle. Wash it out with warm water three times with vigorous shaking. I use a solution of Sodium Percarbonate (found in diaper cleaners such as Napisan), rinse that well, then use a no rinse sanitiser like Starsan, and then fill with beer. To clean the dip tube or ‘spear’ you can remove it by unscrewing the Beer-Out Post, but normally I just pour a kettle of boiling water into the keg, seal quickly and shake, then carefully depress the button in the middle of the Beer-Out post with a screwdriver and get a fountain of boiling hot water that scours out the post (wear gloves and a hat). In closing, this has been an introduction only, you won’t pick up all the skills till you are actually kegging. So your best guide is to talk to the store you are buying your gear from and I am sure they will help you to configure your system and put together a list of all the parts you need to purchase. 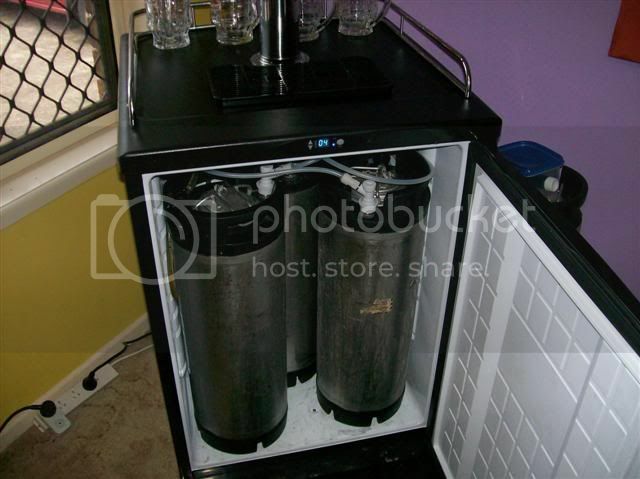 It will also help if you can get to an existing kegger and have a look at their system. Last edited by Beachbum on 21 Mar 2010, 18:51, edited 7 times in total. BeachBum kindly wrote the above ages ago. It was intended to become a "BIABrewer" article 'The Basics of Kegging' but there are so many aspects to kegging that it was hard to get finalised. There are several articles like this that we haven't had time to complete as they do take days of work to get right. Can you fill in the holes that Bribie was unable to? Are there other kegging areas you would like to see covered? Should they be addressed in individual articles instead of a single one? Let us know and sincere apologies to BeachBum that this has taken so long to put on the main board. Thank you BeachBum! However the kegging system has never given a day's worry, which is a good advertisement for setting it up well in the first place. LOL! So sorry this took so long - I fear there are other articles buried deep . I think one important thing to check before buying kegs is the quality of internal welds. Many new kegs are coming on the market. I have been caught out by poor quality welds that impart a metallic flavour (to me it actually tastes like acetaldehyde which I am super sensitive to) to the beer. It was a most frustrating problem to track down. to make contact with all parts of the weld. P.S. In the US we have been seeing more of these for portable brews. Easy to get refilled. Last edited by BobBrews on 02 Jul 2011, 20:05, edited 5 times in total.